Japan has no desert but some sand dunes. 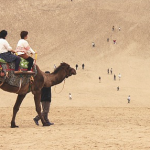 Tottori Sakyu (sand dune) is the largest and a popular tourist destination. Tottori Prefecture is under the radar for foreign tourists as it is at the ‘back’ of Japan (facing Japan Sea) and does not have easy access by Shinkansen. 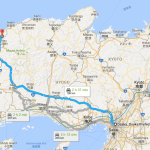 You either take an express train from Osaka (2.5 hours) or drive through motorways (2 hours). From Tottori Station it is a 20-minute bus ride. The dunes are 16km long and 2km wide. It can be challenging to walk to the ocean as they can be as high as 50 meters and of course, totally made of sand. About half a century ago my father lost his wallet while walking up and down the dunes and we had to survive with my mother’s money for the rest of our family trip (We had no bank/credit card). With our kids we pitched a tent in a park under the pine trees, and it got very sandy. A couple of years ago my daughter and her friend had a harder time walking around as it was rainy and windy. 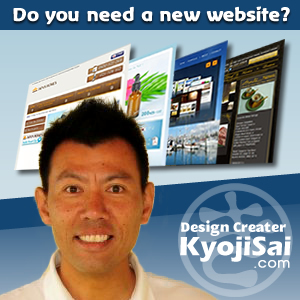 You can ride a camel or a horse drawn cart to make it easier. 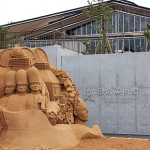 There is a unique museum nearby, The Sand Museum. If you find a brown wallet in the sand, please let me know.